The great white shark (Carcharodon carcharias) occurs naturally in all temperate marine waters. Usually between 9 and 12 feet long (3-4m), it can grow to 20 feet (6.5m) and weigh over two tons. The great white sharks depicted in these photos were encountered at Guadalupe Island, Mexico, although recent scientific evidence suggests that the Isla Guadalupe white sharks roam north through California waters and, perhaps, as far west as the Hawaiian Islands. Great white sharks are predators, the most feared in the world. They begin life feeding on fishes, small rays and sharks, switching as they grow in size to fat-rich blubbery marine mammals such as seals, sea lions and elephant seals. 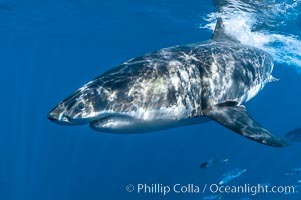 Much contemporary scientific study focuses on the shark -- pinniped relationship, however the importance of this interaction may be overstated simply because the study of white sharks near land-based pinniped rookeries is considerably easier than the study of other white shark predation modes. Known for their fearsome sudden attacks, great white sharks typically surprise their prey by rushing from below and grasping the victim with a powerful, large bite. If the bite is not fatal, the prey is usually left to weaken or die through blood loss (exsanguination), at which time the white shark returns and consumes its prey.